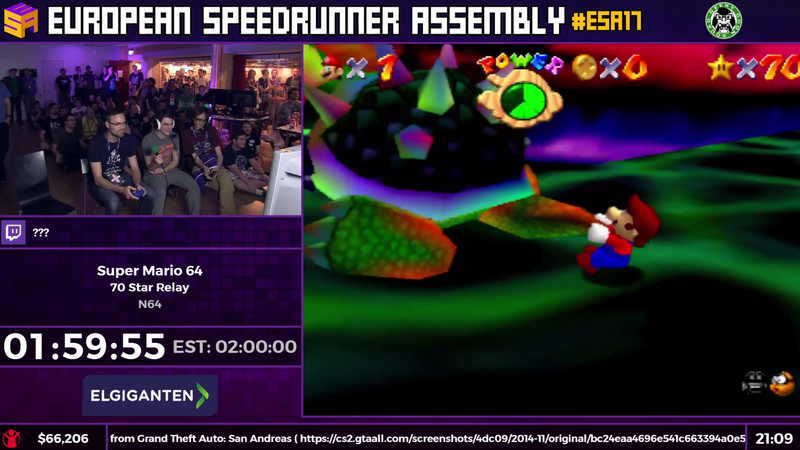 At the 2017 European Speedrunner Assembly, a relay had 70 different people collecting a star each in Super Mario 64. It was pandemonium, and it was one of the most entertaining Mario runs I’ve ever seen. Speedrunners 360Chrism and Fuzzyness hosted a steady stream of Mario players, from well-known players to newcomers who had never speedrun a game, or even played Super Mario 64, prior to the event. After some coaching and proof of mastery, the contestants were lined up and the race was off, with a two-hour finish as the goal. The run started off strong, with the first player up not falling in the moat at the start, a pitfall of most fresh runners. The hosts of the run joke that the first runner drew the short straw, as they have to set the pace and hit two big skips, one of which passes over some significant exposition dialogue. The run went on and on, with players encountering varying degrees of success and failure. Though it was a speedrun exhibition, the event was lighthearted—the crowd laughed and cheered at moments like the one below, where a runner gets bounced out of a world by a disruptive shark. For many runners, it was a place to mess around with new techniques or show off some impressive owl moves. One player had never played the game before and was therefore given the “easiest star in the game”—a static star in Bob-Omb Battlefield mere feet from the previous star, hovering in an accessible spot. Though the run just barely missed the sub-two-hour mark, it was an incredible achievement and a fresh way to experience a game that’s been speedrun to death at so many different events and streams. It’s hard not to clip every little moment that happens over the course of the run, the hilarious misses and the by-a-thread successes. Hopefully this kind of grand exhibition can start to seep into other large speedrunning events too.